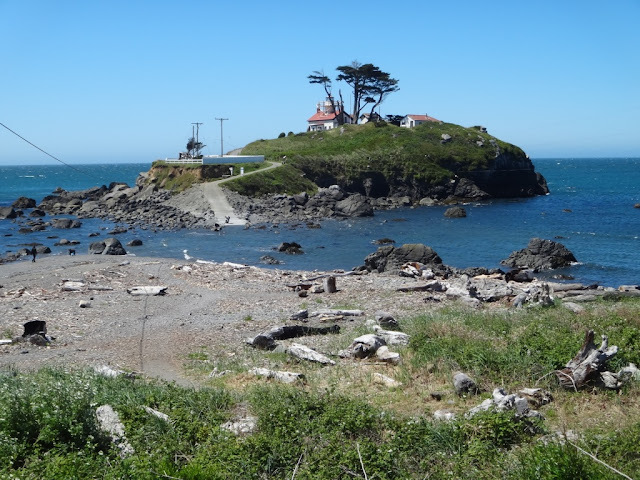 Photograph 1 - Battery Point Lighthouse, located at Crescent City, California. How do we drive Connie across to the lighthouse? Answer - wait for low tide - but it costs $3 USD if we did! Photograph 2 - Our first sighting of the North Pacific Ocean....black beaches!! At Crescent City, California. Photograph 3 - Connie just fits through this big Redwood. At Klamath, California. 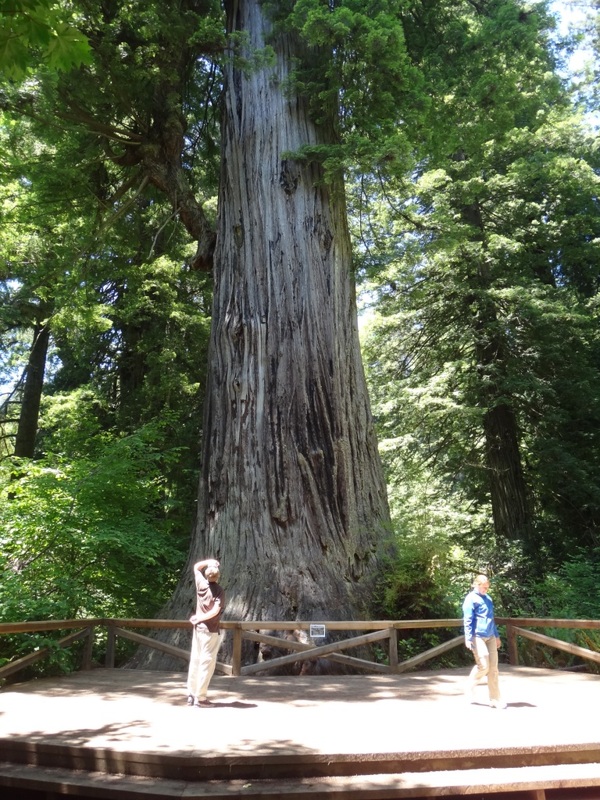 Photograph 4 - And another Connie and Neil redwood experience - Klamath, California. 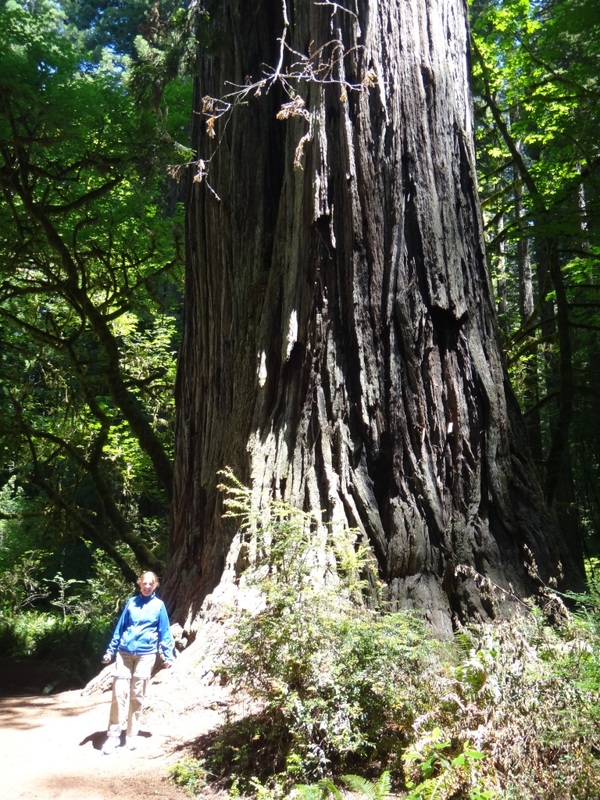 Photograph 5 - Tiny Connie in front of a big redwood along the Newton B Drury Parkway, Prairie Creek Redwood State Park, California. Photograph 6 - Same as above.......Connie is replaced with Anne! 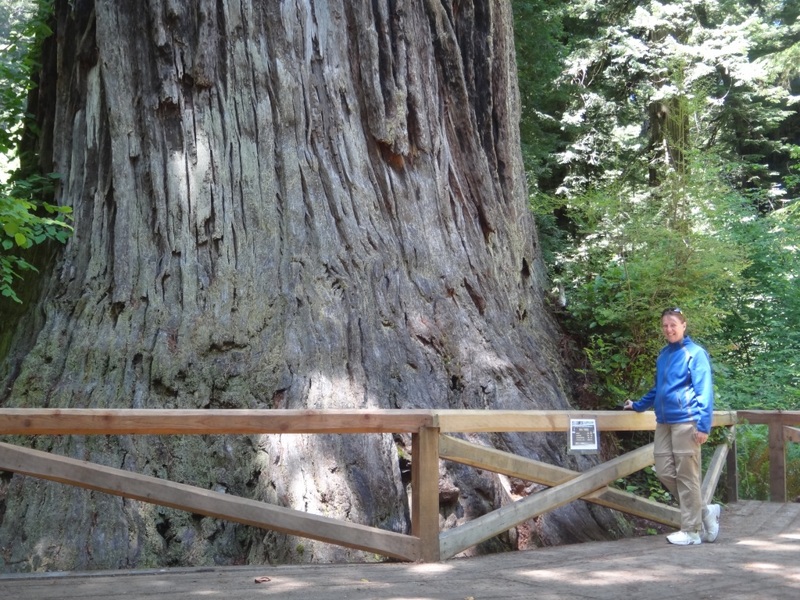 Photograph 7 - This is the Big Tree, a 1500 year old redwood in the Prairie Creek Redwoods State Park, California - boy was it big!!!!!!!!!!!!!!!! Photograph 8 - And again....with Anne. 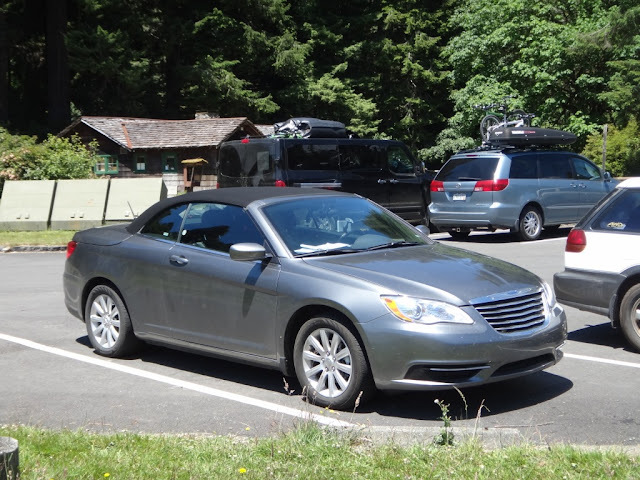 Photograph 9 - Connie with her top on at the Prairie Creek Visitor Centre, California. Photograph 10 - Carson Mansion and old Victorian era building at Eureka, California. No more mountain driving! Today and onward it's coastal views. We left Medford, Oregon at 9am and entered California not long after. California is our last state to visit - that makes it 25 states out of 50 for the entire holiday wow! Admittedly, we only stood on New Mexico soil for ten minutes at Four Corners a few weeks ago. 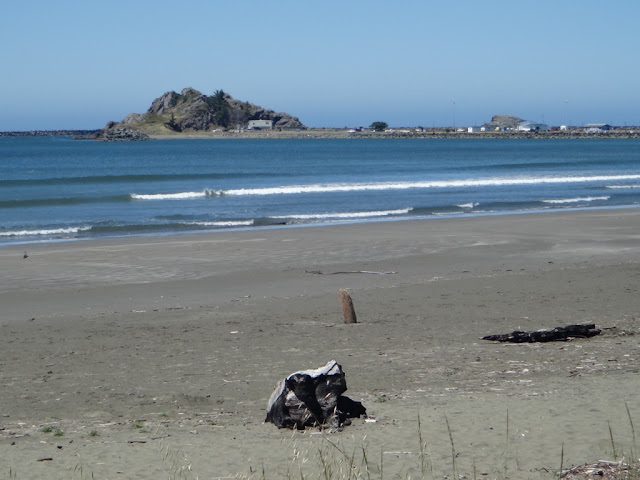 We hit the coast of California at Crescent City and viewed the North Pacific Ocean. Crescent City is supposed to be the most tsunami prone city in the US due to its frontal aspect to Japan and the ring-of-fire earthquake region. What we did see were black beaches - nothing to rave on about and no where as good as Ozzie golden sands. Also at Crescent City was Battery Point Lighthouse. 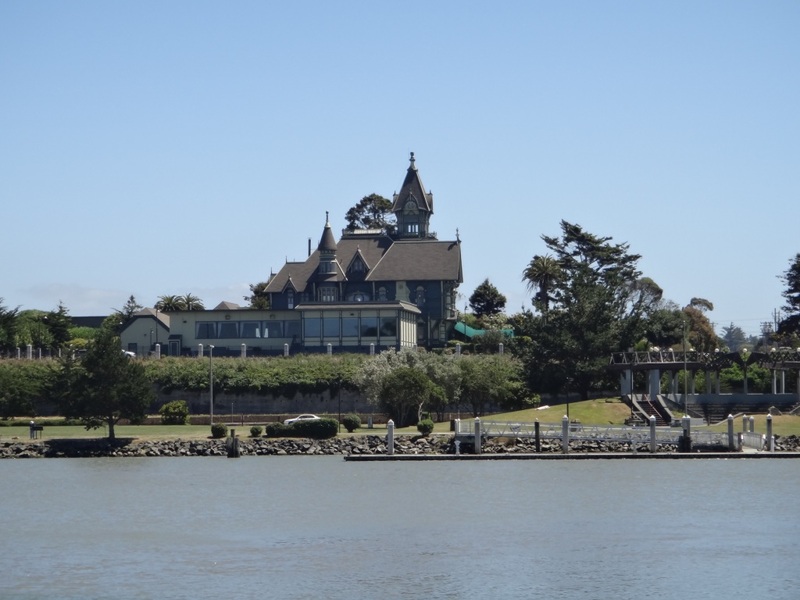 It sits on an island and has a road connecting to the mainland. It is only used by vehicles during low tides. They also charge $3 to do this. 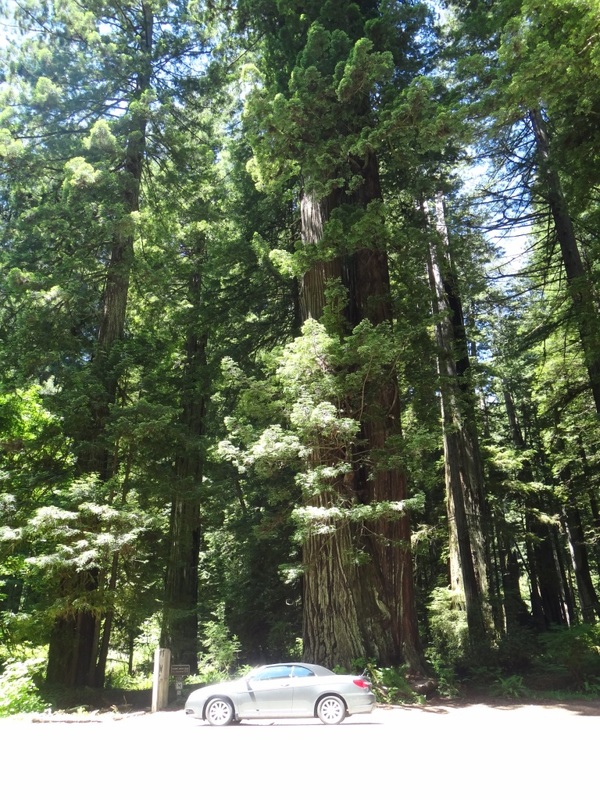 Driving on to a city called Eureka we passed through the famous redwood forest. Gee.....the trees are huge. Some are over 1500 years old and we keep thinking it would be a shame to cut them down after surviving many natural disasters and no interference by humans. Thank goodness, these magnificent trees are protected and are within a National State Park. 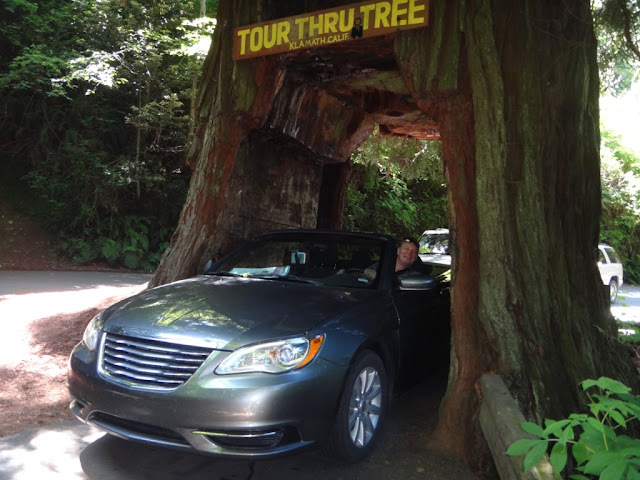 We did manage to drive through one tree (see picture above). It was a revenue for the owner who has this tree on their property - but at $5 a visit it was worth it. Eureka is a coastal city and the hub within this region. It appears that any population of 500 plus can be called a city. Our destination tonight is Fortuna and is a city that has been bypassed by the expressway. However, it still retains its busy countenance and has a large Safeway Plaza. We both managed to have a well-needed hair cut in a salon. The hairdresser remarked that she loved our Australian accent. Tonight Fortuna is having a pre-Fourth of July fireworks display in the local park Since it doesn't get dark until 9pm in these parts we decided to give it amiss. Speaking about fireworks, anybody over 18 years old can buy crackers or fireworks just like we used to in Australia back in them olde days. As for Anne's birthday - she is celebrating a 42 hour birthday today - 17 hours of Australian time plus the 24 hours American time!! Tomorrow is actually the 4th-of-July here in the states and we have a seven hour drive to San Francisco. Actually we will be staying at a nearby suburb called Pacifica. 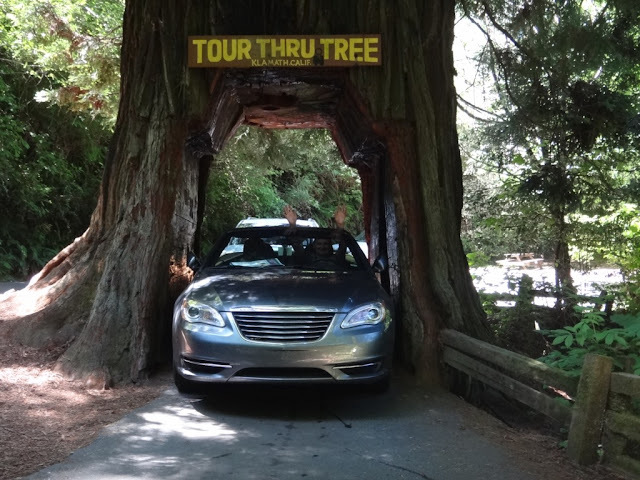 To get there we will be driving over the Golden Gate Bridge - we are looking forward to this. Also we look forward to how SF will celebrate its 4 of July and naturally, Anne enjoying her extended birthday. Until tomorrow - cheers.